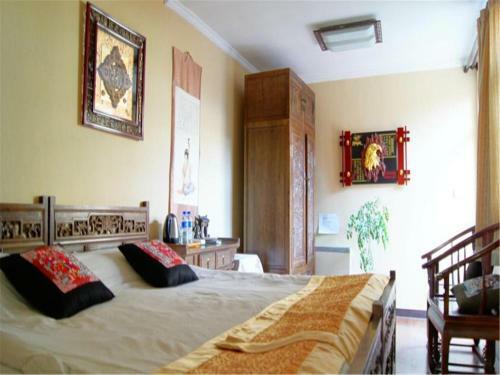 Featuring free WiFi throughout the property, Emperors Guards Station-courtyard view Hou Hai is situated in Beijing, 800 metres from Nan Luo Gu Xiang. Beijing Hutong is 900 metres from Emperors Guards Station-courtyard view Hou Hai, while Houhai Bar Street is 1.2 km from the property. Beijing Nanyuan Airport is 17 km away. Each room at this bed and breakfast is air conditioned and comes with a flat-screen TV with cable channels. You will find a kettle in the room. All rooms come with a private bathroom. For your comfort, you will find slippers and free toiletries. You will find a 24-hour front desk offering express check-in/check-out service at the property. Luggage storage space and daily maid service are available at the hotel. Please note that can the hotel can provide free breakfast. Please kindly inform hotel if guests need breakfast because the hotel needs time to prepare it. Please inform Emperors Guards Station-courtyard view Hou Hai in advance of your expected arrival time. You can use the Special Requests box when booking, or contact the property directly with the contact details provided in your confirmation. Payment before arrival via bank transfer is required. The property will contact you after you book to provide instructions. السعر: CNY 268.00 ... CNY 358.00; select dates below to get current rates.